Abstract: The mitochondrial permeability transition pore (MPTP) is a major contributor to acute pancreatitis (AP), causing loss of mitochondrial membrane potential, diminished ATP production and pancreatic acinar cell (PAC) necrosis. Cyclophilin D (CypD) promotes formation of the MPTP. We aim to develop small molecule (SM) inhibitors of CypD as a possible treatment for AP and other conditions where the MPTP plays a role. Molecular modelling was used to identify SMs predicted to bind with human CypD. SMs (coded 3C28, 3C34, 3C41 and 3C53) showed affinity for CypD with Kd values of 4.9, 0.5, 1.1 and 0.06 micromolar, respectively in isothermal titration calorimetry. The Ki values of 3C28, 3C34, 3C41 and 3C53 were 9.1, 0.1, 0.95 and 0.032 micromolar, respectively in PPIase assay. Structures of CypD/SMs complexes were determined by X-ray crystallography. The compounds (10 micromolar) protected membrane potential and significantly reduced necrosis of freshly isolated PACs in the presence of a pancreatitis toxin, taurolithocholate acid sulphate. SMs 3C28, 3C34, 3C41 and 3C53 bind with and modulate the PPIase activity of CypD, preserve mitochondrial membrane potential and inhibit necrosis in PACs, at Kd/Ki that is below 100 nanomolar for 3C53. Further medicinal chemistry optimisation of our SMs is underway. Summary: Cyclophilin D (CypD) promotes opening of the mitochondrial permeability transition pore, a major contributor to acute pancreatitis. We are developing small molecule inhibitors of CypD as a possible treatment for AP and other conditions where the MPTP plays a role.References: Mukherjee et al. 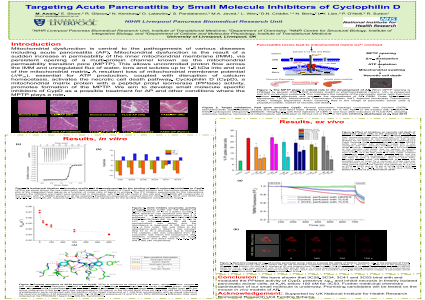 Mechanism of mitochondrial permeability transition pore induction and damage in the pancreas: inhibition prevents acute pancreatitis by protecting production of ATP. Gut 2015, doi: 10.1136/gutjnl-2014-30855.